Trying to be wordless! Look in the distance at the queues of cars in the roads. I amused myself by taking pictures - I have NEVER seen a petrol station this full! 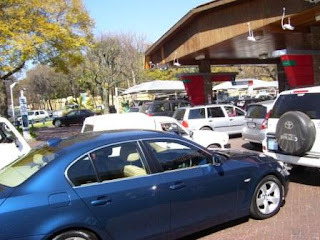 There is/ was a petrol shortage because the guys driving the petrol to the stations were striking (probably for more money - most strikes in SA are for more money) so very little petrol was delivered to the stations! 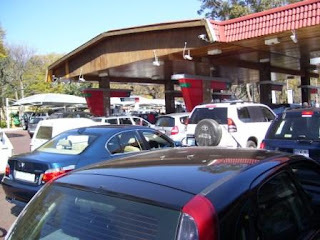 For those of us in other areas like the U.S., can you tell us why there is a petrol shortage? That picture reminds me of the 1970's here when we had gas rationing. That's a lot of cars! WOW!! I've never seen cars backed up like that! Thanks for stopping by my blog and WW!